Search Results for "christmas decoration outdoor"
21. 01. 2017 - Kiev, Ukraine. Open-air ice rink in the dead of night. Bright Christmas decorations. 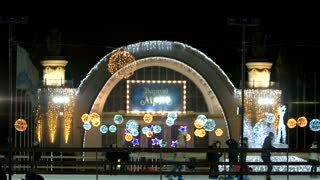 Beautiful christmas decorations and evening lights, outdoors at xmas fair outdoors at night. Deer and mill. close-up, a woman decorates Christmas tree outdoors with Christmas decorations. Christmas toys hanging on a snow-covered tree branch. winter, frosty, snowy, sunny day. CHERKASY REGION, UKRAINE, DECEMBER 25, 2018: winter, frosty, snowy, sunny day. Happy family with little children decorate Christmas tree outdoors with Christmas decorations. CHERKASY REGION, UKRAINE, DECEMBER 25, 2018: winter, frosty, snowy, sunny day. a man, father decorates Christmas tree outdoors with Christmas decorations. CHERKASY REGION, UKRAINE, DECEMBER 25, 2018: winter, frosty, snowy, sunny day. mother is warming her little daughter's hands. They decorate Christmas tree outdoors with Christmas decorations. Hyperlapse of Christmas outdoor decoration and dancing fountains in Espace Jacques Medecin in Nice, France. 07 December 2016. Outdoors Xmas tree decorated with christmas lights on square of cozy snowbound alpine township at snowy winter night. Festive 3D animation for Xmas or New Year holidays. Crowd of people dance and celebrate Xmas or New Year near outdoor decorated Christmas tree on snow covered square of cozy alpine mountain township at winter night. Festive 3D animation. Christmas abstract background. Blurred festive outdoor decorations, tree illumination, nice bokeh and people walking on street covered in snow in the evening.